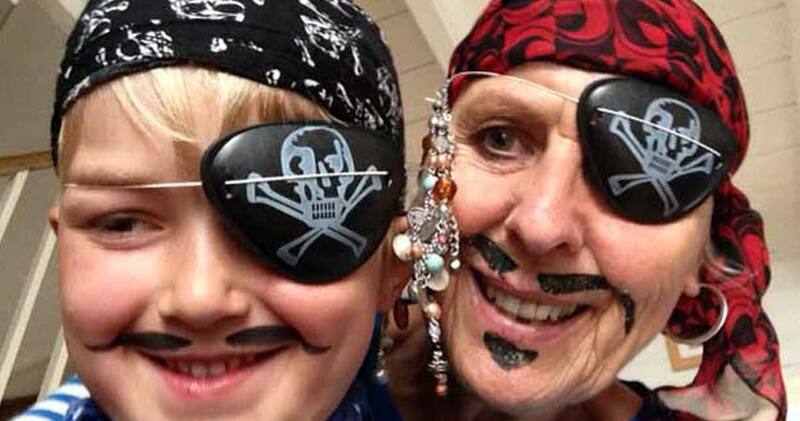 As the organisers were aiming for 20,000 pirates this time we decided to drag Mum and Dad along to swell the numbers and to go by train so we didn’t have to worry about parking the car. We set off from Penryn and felt very conspicuous in our village being the only pirates in the shop but as soon as we got to the station there were other pirates waiting. The train was 80% pirates and the conductor even gave his platform arrival notices in a pirate accent with plenty of ‘ahoy there me hearties and avast e landlubbers’ in a cross between a pirate and a Cornish accent. Megs and Wilf were set a challenge to spot tin mine chimneys on the way. To enter the Pirate Count site you must be dressed as a pirate. This can be as simple as black skirt, black trousers or striped trousers rolled up and a white or striped top, a pirate style hat, bandana or ready-formed zandana. You must also have at least two accessories from the following list: eye patch, hook, spyglass, compass, sword or cutlass, pirate pistol, cummerbund or sash. On the other hand you may want to dress in the full pirate garb, either costume or authentic clothing. Maybe a parrot, ship’s cat, scupper rat (alive, stuffed or toy)! Basically come looking the part and you’ll be counted in and become a World Record holder. It was a sight to behold with pirates everywhere you looked – in fact people not wearing costumes must have felt very odd, they certainly were in the minority! The whole of the promenade had a festival atmosphere amongst the jostling crowds with Punch and Judy, swing boats, tented stalls selling tempting things to eat and local bands and groups to entertain everyone. There were even pirate things going on on the water – we saw a pirate being forced to walk the plank and saved by the RNLI as well as a flotilla of traditional working boats. Half way down the promenade were two red flags denoting the counting area and we had to queue to prove our pirate qualifications and receive an official wristband. At 4pm everyone gathered in this one spot for the result of the count announced by Radio Cornwall presenter Lawrence Read – 14,155 pirates. It was disappointing to hear that we had missed the world record set by Hastings last year by only 77 pirates. However, as Hastings has about four times the population of Penzance, to get 14,155 pirates in Penzance is a real achievement! It was a lovely day and will spur us to gather more friends and family to try for the next world record. Let’s hope plenty of doubloons rolled in for the RNLI! You can get a taste of what it was like in the video below. Shiver me timbers – that’s a lot of pirates!